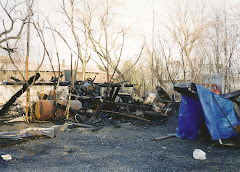 This blog is a forum for those who claim Warwick, NY as their hometown as well as those who have had experiences there that they wish to share. It is a means for reconnecting with both place and people. 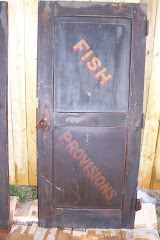 It invites the sharing of stories of the distant as well as the recent past. 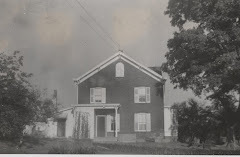 Its stories, when possible, are in some way connected with a photograph or artifact originating from Warwick, NY. In the winter of 1958, Roscoe W. Smith, founder and director of Old Museum Village of Smith’s Clove received a letter from David Baird, an assistant Curator of Vertebrate Paleontology in Princeton University’s Department of Geology. There had been several letters of inquiry on the part of Smith in 1956 regarding an early plaster cast of a megatherium americanum, or what was more commonly known as a giant ground sloth from the post Ice Age period at Princeton’s Guyot Hall. 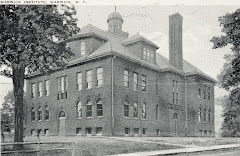 Smith had received information that the university would eventually be de-accessioning the 1867 cast that had long been a teaching tool for classes in Vertebrate Paleontology, as there were plans to move the contents of Guyot Hall and raze the building for a new dormitory. As Baird would point out in his correspondence with the founder-director, “every 19th century museum of distinction had one of these casts as its centerpiece.” Over time, the Princeton cast, which is 13 feet tall and had first been exhibited at Nassau Hall in 1876 on the Princeton campus, had become something of a rarity as competition for museum space, greater availability of actual skeletons, and periodic shifts in choices of what life to emphasize from pre-history had unfolded over time. The actual skeleton from which the cast was made came from a discovery in the 1830s on the River Luxan, near Buenos Ayres. The bones were, as of 1959, divided between the Hunterian Museum of the Royal College of Surgeons, and the British Museum. 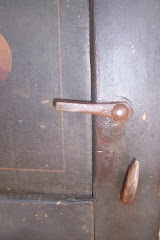 Smith’s inquiries about the Princeton cast were motivated out of his ongoing plans to create a museum within a museum. The contrived 19th century museum or cabinet of curiosities on a large scale was one of 30 buildings at the museum that housed collections accrued largely by Smith himself. 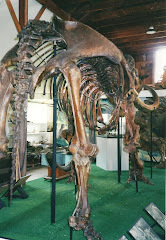 Particularly, the Natural History building showcased one of the most complete examples of a mastodont americanum, or Mastodon, ever exhumed. 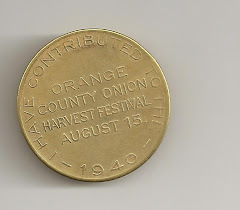 Orange County is actually the birthplace of vertebrate paleontology, as the first mastodon exhumed and eventually assembled was by Charles Willson Peale under the sponsorship of Thomas Jefferson in Montgomery, New York. At this present date, the remains of sixty nine different mastodons have been unearthed in New York State. This is the plaster cast of the giant ground sloth at Museum Village. 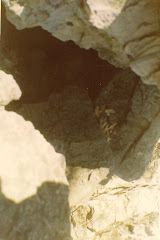 The theory is that the claw bone excavated in Orange County was incorporated into this cast, as the whereabouts of the identified real sloth claw is not known. 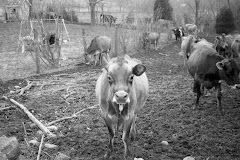 In 1952, during the construction of New York’s Route 17, which is proximate to Museum Village, Smith’s “Harriman Mastodon” was discovered in a meadow owned by Mrs. Edith Loostron when contractors Garcia and John Leinweber of Warwick were cleaning and widening a drainage ditch with a gasoline engine driven shovel or loader." 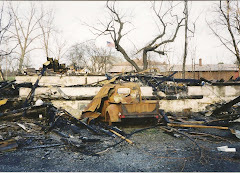 The bones were exposed, "washed up" and taken "to Arden House, owned and used by Columbia University and shown there. No particular interest being shown, they then took them home to Warwick. 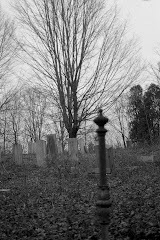 The Warwick Dispatch photographed them and published a short news article and picture of the bones." 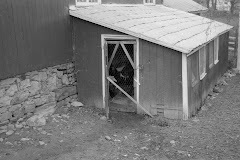 Mith learned of the find and made arrangements with Mrs. Loostron to dig for the rest of the bones and to have all that were found. "The American Museum of Natural History was contacted and told of the find and asked if they could furnish an expert to supervise the excavating" and removal of bones. W.E. Fish from the museum quickly responded and exhumation of the remaining skeleton moved ahead. 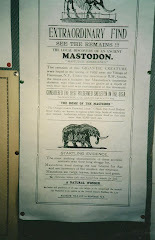 There were already remains of mastodons in the collection at this point, as any such remains were always being sought. Among these was a tusk that Smith had acquired in 1925. 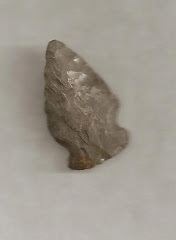 There would also be other finds, including another nearly complete mastodon uncovered during work on the twin lakes in Monroe, also in proximity to the museum. 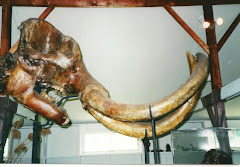 This mastodon would eventually make its way to Germany where it remains. 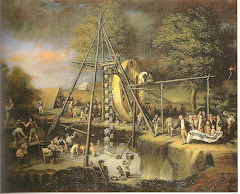 The exhumation of a mastodon was still quite an endeavor in 1952, as it had been for Peale back in 1801, with the necessity for hoisting equipment and water pumps. By today’s standards, there was much manual labor involved. 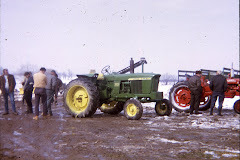 Existing film footage in the museum’s collection illustrates the necessity of dozens of men with spades in hand and knee deep in mud. 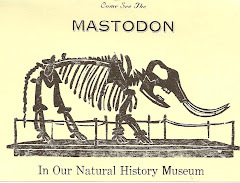 For the assembly of the mastodon skeleton and its preservation the American Museum of Natural History was sought out, and Dr. Edwin S. Colbert and George O. Whitaker were engaged to take on the project. It was Whitaker who eventually supervised the reconstruction in the newly created Natural History building at the museum. The project was completed in 1955. Whitaker would also be integral to the sloth project. Getting him for the project was seemingly not that easy, as he was much sought-after. Various projects detained him temporarily for the pressing task of removing the sloth from Princeton in 1959, including the assembly of a 65 foot sauropod dinosaur for the Cleveland Museum of Natural History. A number of years before a piece of what had been conclusively identified as a piece of a megatherium had been found only a mile from the Museum Village site in a meadow of black dirt, and Smith had acquired this for his museum. 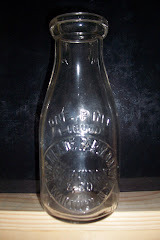 This was a rare find, as no other remains of a ground sloth had been found or since this find. The rarity of ground sloth remains in Orange County is largely attributed to the fact that this quadruped was attracted to highland terrains where trees were available for sustenance. These regions were not a good environment for long term preservation like the mastodons that had ideally been encased in a layer of marl, or clay, under the areas’ black dirt. 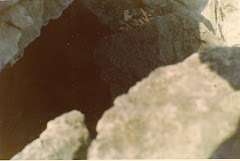 It is this black dirt and marl that are the remains of glacial lakes of the post Ice Age period. What is often overlooked by laymen visitors is the fact that mastodon remains, including Museum Village’s own nearly complete specimen assembled in its Natural History building, consist of bone remains rather than fossils. 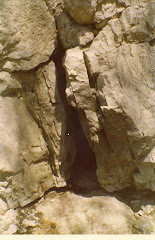 This is a phenomenon whereby bone tissue, as in the case of earlier dinosaurs, was replaced by minerals which subsequently solidified into a rock form over the course of millions of years. The mastodon, nor the sloth, are dinosaurs; they are early mammals that were actually hunted and eaten by modern man more than 10,000 years ago; in fact, one theory argues that the mastodon, which was dwindling in numbers from environmental conditions from a radical increase of the earth’s temperature in a short period, was hunted to extinction by Paleolithic Indians that had recently migrated to North America, including Orange County, New York. This may be true of the sloth as well, but more conclusive is the fact that the terrain which the sloth preferred was not the kind of terrain that would sustain its skeletal remains after death for tens of thousands of years. Other animals and climate conditions would have erased almost all signs of the sloth in a short time. 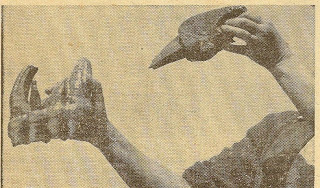 In addition to the claw bone of a sloth, Smith claimed that during the exhumation of the Harriman mastodon “several other small bones” were discovered. and these he states were identified by the American Museum of Natural History as “bison bones”, which Smith adds “so I suppose we can believe that buffalos roamed this country in bygone days.” The bison bones are mentioned several times in Smith's correspondence with Dr. Glenn Jepsen of Princeton, but no other documentation has been found to verify this. To this date, the paleontology community have no documented giant bison finds in Orange County, NY. Further research will be done, as this may be an important unpublished discovery. Given the limited remains of both the sloth and bison, Smith had been motivated to secure life size plaster casts to supplement them for the sake of especially young visitors who, it was believed, would otherwise take little away from the experience of seeing a few fragments of the large post Ice Age mammals. Initially, Colbert expressed concern about the use of plaster casts, as he believed they alone would serve as unconvincing evidence to the public that such creatures existed; it is authentic bones or fossils alone that are the required evidence he would argue. Colbert did eventually concede that in combination with the actual bones, a plaster cast may serve a role until some future discovery provides an alternative. 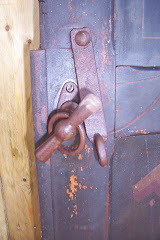 Plans were made for the repairs soon, and Whitaker made a “promise… [to] come in his spare time and do the finishing” of the plaster repairs. Smith sought others from New York to assist. 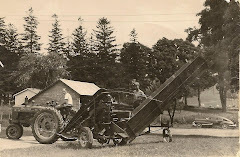 The repairs were accomplished, and to this day the sloth stands where it was completely re-assembled in 1960 with visible repairs resulting from that day’s mishap. They are concentrated in the upper part of the skeleton, including a number of ribs..
By March of 1960, in a follow-up to Dr. Jepsen, Smith reported that George Whitaker was still at work on the repairs of the sloth, and it was anticipated that the damaged ribs would be entirely repaired after yet another future weekend of work. At Princeton, Guyot Hall had since been torn down, and, ironically, in excavating the site ‘a fossil bone of the reptile Clepsysaurus, a 275,000,000-year-old ancestor of the modern crocodile, had been found! 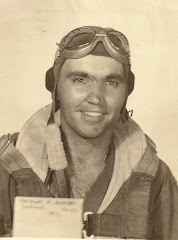 Raymond Benedict, c.1942. I found this photograph sitting on some leaves one Fall day when the neighborhood kids and I were playing around Church Street some thirty years ago [more specifically 1974/1975 when I was 11/12 years old ]. We all thought that it looked like Lee Majors from The Six Million Dollar Man. 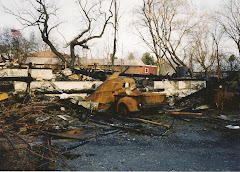 My guess is that the photo came from the old VFW which was once headquartered in the quonset roofed addition to the old Warwick Hospital building on Forrester Avenue. I remember telling Joel Benedict, who was a few years older than me in school, that I had found this photograph. This is Raymond Benedict of Bellvale, NY. 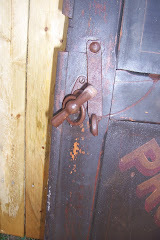 "Hare Ice Service; Warwick, NY Phone: 395; Greenwood Lake, NY Phone 231", Ice Pick, circa 1930. 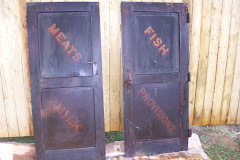 Robert Schmick Collection. 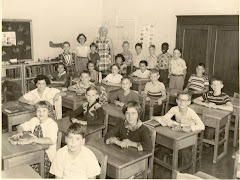 Mrs. Baum's Class (c.1955? ); John Porvaznik is the kid with glasses, and my mom, Cheryl [Miller] Schmick (1944-2004) is the first girl standing in the back row on the left side. Recognize anyone else? To Mrs. Baum's left is John Baird. I have a larger version of this in digital form if anyone would like a copy just email me. 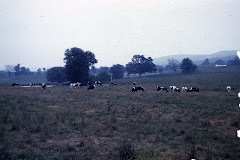 This photo and those that follow were taken in the 1930s when my great grandfather and mother, [Johann] Phillip Kiel and Katherine Schlagel Kiel owned this dairy farm located at the corner of County Rt. 1 and Horseshoe Lane in Little York, Pine Island. 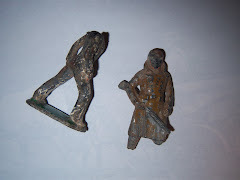 Two of a number of toy lead soldiers I unearthed on one of the Raynor's old dumps on Fair Meade Farm in the early 70s while fishing trout in the nearby creek. Fair Meade Farm, Rt.94 not visible but cuts through center of this view. 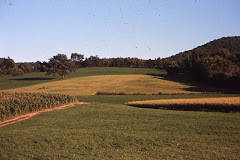 The lone tree in the field is still there, c.1960. 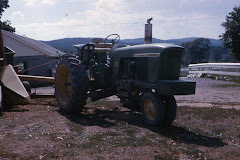 Fair Meade Farm, before Twin State Ford ( Leo Kaytes Ford) c.1960. Fair Meade Farm, Rt.94.The apple orchard above the Warwick Drive-In as it looked. 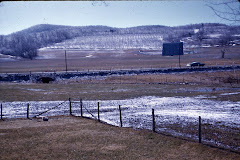 Notice the old steel reinforced concrete posts and cable fence that ran along this stretch of Rt.94; many a car got taggled up in that until they removed it (c.1960). Pond on Fair Meade Farm looking down Rt. 94 towards NJ before Frontier Lanes, c.1960. 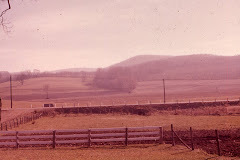 Before Frontier Lanes was built. Looking down Rt. 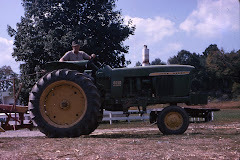 94 Towards NJ on Fair Meade Farm, c.1960. 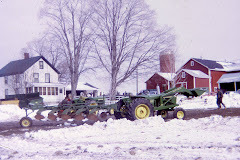 The Great Snowstorm of 1947 aftermath, Phillip Kiel Farm, Little York, Pine Island, NY. 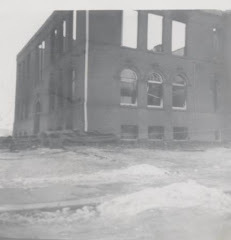 Snowstorm aftermath, Little York, Pine Island, 1947. 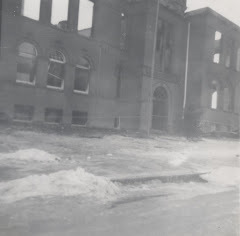 Aftermath of the High Street School (Warwick Institute) fire, January,1951. 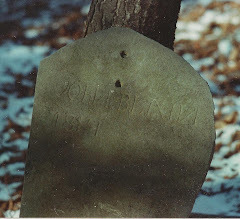 The Presbyterian Churchyard in Amity, NY (c.1987). This was taken near the bridge on Sanfordville Rd. 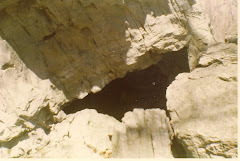 (c.1987). Just before the bridge on Sanfordville Rd. 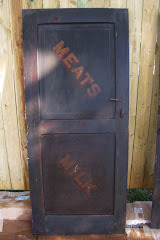 was a farm. 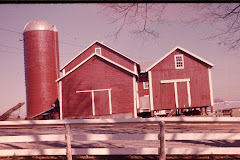 The barns had been re-painted and repaired after seemingly sitting unused for many years when I snapped this picture. 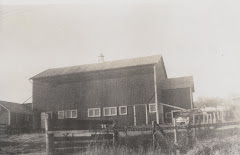 There was a small two-story house that went with this barn. 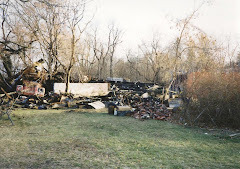 For many years, that house was occupied by Travi Jackson and his family. 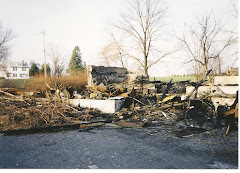 The house burned to the ground sometime in the 1970s (c.1987). 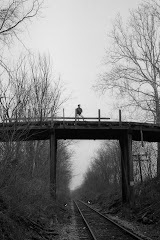 The old bridge on Sanfordville Rd. It was closed sometime before the 80s, but I remember the thrill of going over this bridge in a car years before (c.1987). 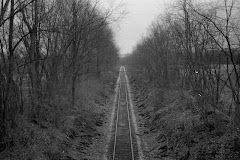 The railroad tracks stretching under the old bridge on Sanfordville Rd. (c.1987). 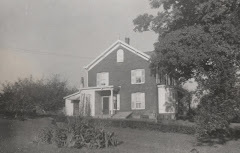 The Sanford (Lawrence) Farm, c.1940. 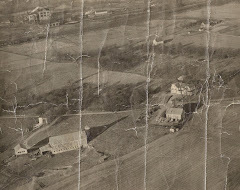 This aerial view includes the Lehigh & Hudson railyards as well as some of the Pelton Farm. 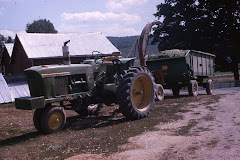 My grandfather, Paul Miller, rented this farm between c.1938-1947, so the equipment parked about the outbuildings was his. 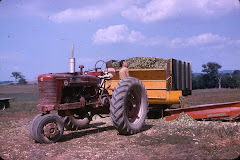 This includes the tractor which I believe to be his first. The Creek (Black Rock Creek?) 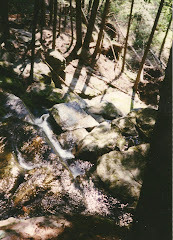 I have to admit that I don't know the name of this creek that runs down Moe Mountain on the west side of Fair Meade Farm through a culvert under Rt.94 on to what was the east side of Fair Meade Farm (Petrucci property) where it formed a pond which ran on behind the old Decker Farm (?). The Creek ( Black Rock Creek? ), c.1987. 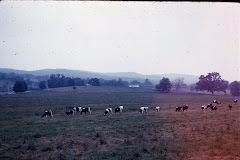 This photo was taken somewhere above Fair Meade Farm on Moe Mountain. This is the creek that seemingly runs all the way from behind the South Street Extension housing development. 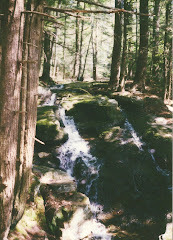 My friends and I fished some trout out of this creek back in the mid-1970s. 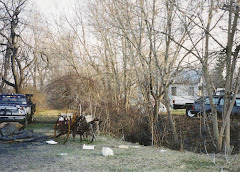 I was recently informed by an old friend who grew up near the creek that all the building in the last twenty years has sucked up all the ground water leaving this creek nothing more than a trickle. An Adams & Westlake of Chicago, IL Railroad Signaling Lantern, Adlake Model No. 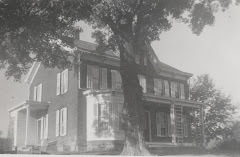 250, c.1923. 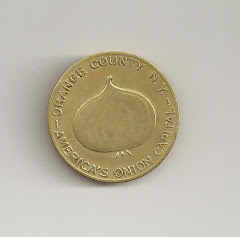 There is a convex stamp on top that reads "C__R CO. of NJ. It is my belief that this was from The Central Railroad of New Jersey. This lantern for a long time sat on the hearth of the living room in the main house at Fair Meade Farm on Rt.94. 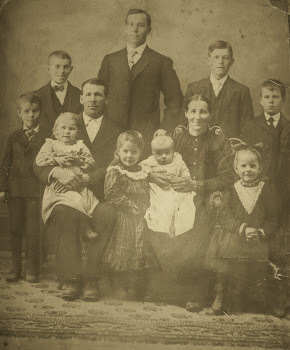 I know that my great grandfather, Phillip Kiel, worked for the Lehigh & Hudson Railroad. 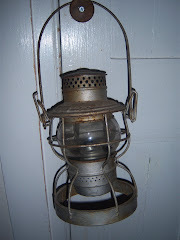 The identification of The Central Railroad of New Jersey name on this lantern is an interesting one, for it evidences not only rail travel in the area but Warwick's connection to a vast network of railroads. 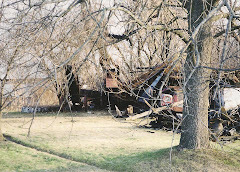 The Lehigh & Hudson's Warwick train stops originated in Belvidere, NJ as many know. The L&H had many stops throughout Northern NJ, and it is not unlikely that this lantern found its way to Warwick through the common practice of borrowing and using other railroads' equipment, especially when they shared track and common destinations. 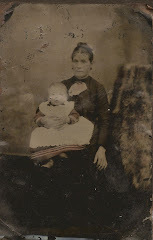 I discovered these two tintypes under the floor boards in the attic of 22 High Street in Warwick around 1973 or 1974. Mingled with these were some envelopes with postmarks from the 1890s. Unfortunately I kept the stamps but discarded the envelopes. There were also brittle copies of The Warwick Dispatch from the 1890s and a copy of The New York World with the headline "The USS Maine has been sunk in Havana harbor (1898)." The exact wording escapes me. 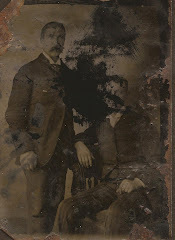 If anyone has a clue to who these tintypes are of, please contact me. This is a Christmas card sent from Grace [Pelton] Holbert (who I believe lived on the Pelton Farm, that is now owned by Tunis Sweetman, all of her life) to my grandparents, Paul and Emma Miller, in 1955. 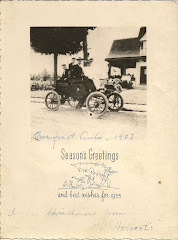 If this was the Pelton family's first car then is this Oakland Avenue in the background as I suspect in 1903? 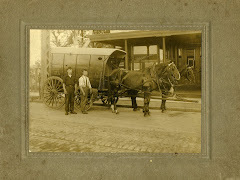 If so, it is likely that this was one of the first automobiles in Warwick. 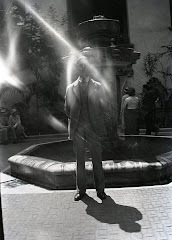 One of my most treasured photographs, and one that is in very bad condition. 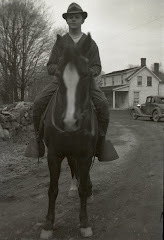 The team of horses is presumably Paul Miller's when he rented the Lawrence (Sanford) Farm, circa 1937. The two bare-chested fellows in the photo are unknown. 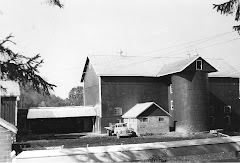 If anyone could verify that there was a water tower like the one on the right at the Lawrence farm at this time and why it was used please contact me. 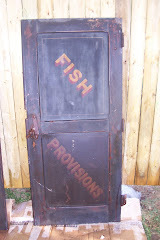 The structure might be an elevated corn crib? As of May 28, 2009, I have upon closer examination of this photo realized it was probably taken around 1942-3 instead of 1937 because a seemingly 4-5 year old Bob Miller ( Paul Miller Jr.) is standing next to the two fellows on the left. I didn't see that before because of the poor quality of the photo. 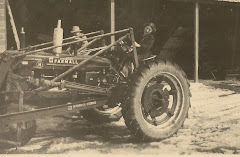 My grandfather is at the reigns of the horses that are pulling a spring harrow. 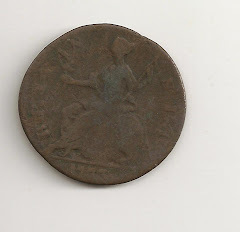 1773 Colonial Half Penny, Unearthed on the green of the Old School Baptist Church, Warwick, NY (c.1973). 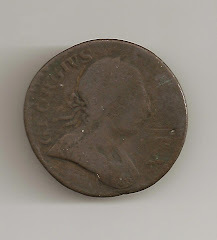 1773 Colonial Half Penny, reverse, Unearthed on the green of the Old School Baptist Church, Warwick, NY (c.1973). 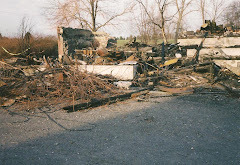 The following November, 2004 pictures are of the aftermath of the Webster Feed & Grain barn fire in Pine Island, NY. 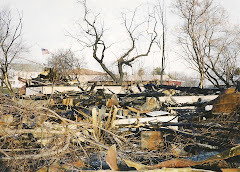 In addition to the tragedy of losing this landmark structure, there was a large collection of local Native American artifacts collected by Jack Webster and his late father destroyed by the fire. I received my MA and Ph.D. from New York University in Education. 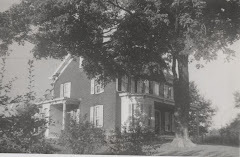 I am the museum director of 19th Century Willowbrook Village.